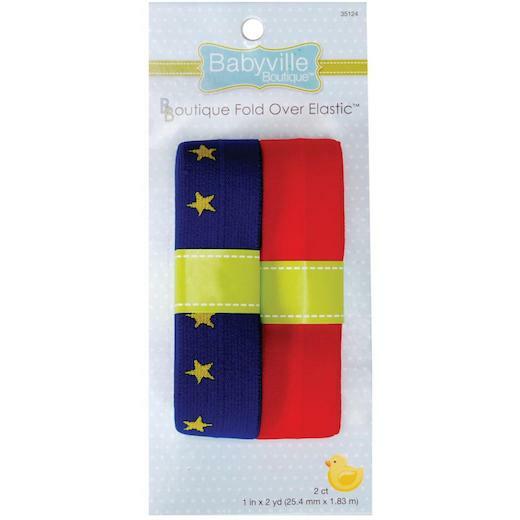 Babyville Boutique Fold Over Elastic finishes the edges of diapers and diaper covers to securely fit baby and also provides a decorative and functional finish to many other types of apparel and craft projects. Designed to coordinate with Babyville Boutique PUL fabrics (sold separately). This package contains two 2 yards (1.83m) fold over elastics 1 inch (25mm) wide. Nylon/Spandex blend. Machine and dryer safe. Do not bleach. WARNING: Strangulation Hazard - keep cord out of reach of children.